Sewing was only taught to girls after 1870 when drawing was considered to be more suitable for boys. It was considered an important subject as few people could afford sewing machines and girls were expected to make clothes for their families in the future. It was also an important skill for domestic service. 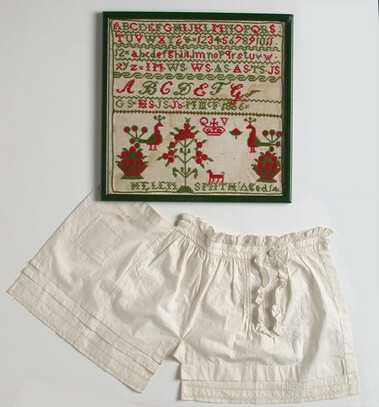 A sampler is a 'sample' of the different stitches a girl could do and demonstrates her skill. Girls would practise different stitches, sewing on buttons, hemming, gathering, eyelet holes, pleats, patching and other sewing skills. 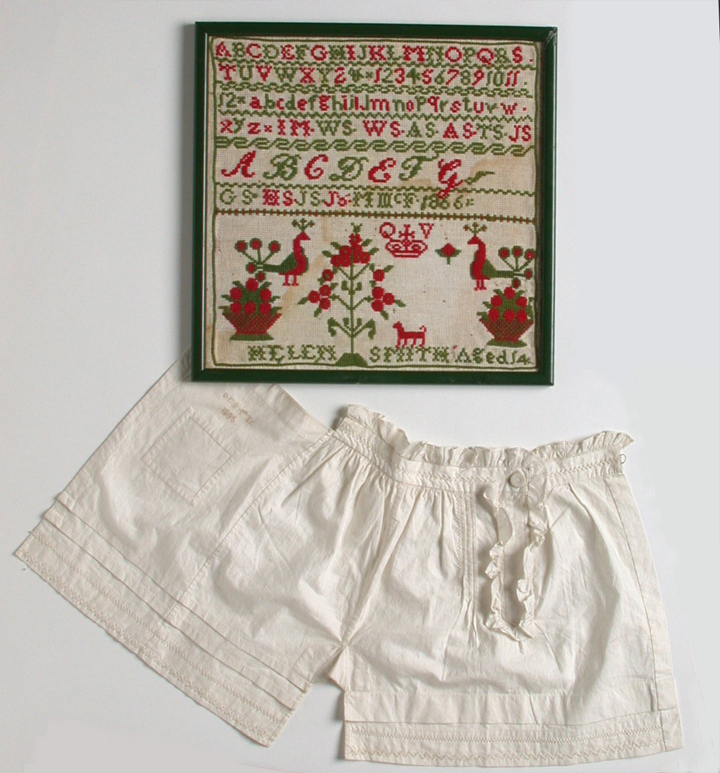 The embroidery on the coloured sampler shows that it was made by a fourteen year old girl named Helen Smith in 1886. As well as the letters of the alphabet in upper and lower case and the numbers 1-10, the decorative details include a crown and the letters 'Q V' for Queen Victoria, two peacocks, a dog and flowers. The other sampler is made of a piece of white cotton. It shows pin-tucks, hemming, pleats, buttonholes, patching and seams. The stitchwork is minute and incredibly precise. On the left hand side are embroidered the initials D.C.B next to '4th Yr' and the date 1895. Samplers would often feature moral messages or maxims to encourage good behaviour, such as 'a stitch in time saves nine'.